Western blotting is an important technique used in cell and molecular biology. By using a western blot, researchers are able to identify specific proteins from a complex mixture of proteins extracted from cells. The technique uses three elements to accomplish this task: (1) separation by size, (2) transfer to a solid support, and (3) marking target protein using a proper primary and secondary antibody to visualize. This paper will attempt to explain the technique and theory behind western blot, and offer some ways to troubleshoot. Western blot is often used in research to separate and identify proteins. In this technique a mixture of proteins is separated based on molecular weight, and thus by type, through gel electrophoresis. These results are then transferred to a membrane producing a band for each protein. The membrane is then incubated with labels antibodies specific to the protein of interest. The unbound antibody is washed off leaving only the bound antibody to the protein of interest. The bound antibodies are then detected by developing the film. As the antibodies only bind to the protein of interest, only one band should be visible. The thickness of the band corresponds to the amount of protein present; thus doing a standard can indicate the amount of protein present. The paper will first describe the protocol for western blot, accompanied by pictures to help the reader and theory to rationalize the protocol. This will be followed by the theoretical explanation of the procedure, and in the later section, troubleshooting tips for common problems. Protein can be extracted from different kind of samples, such as tissue or cells. Below is the protocol to extract proteins from adherent cells. Wash cells in the tissue culture flask or dish by adding cold phosphate buffered saline (PBS) and rocking gently. Discard PBS. (Tip: Keep tissue culture dish on ice throughout). Add PBS and use a cell scraper to dislodge the cells. Pipette the mixture into microcentrifuge tubes. Centrifuge at 1500 RPM for 5 minutes and discard the supernatant. Add 180 μL of ice cold cell lysis buffer with 20 μL fresh protease inhibitor cocktail. (Tip: If protein concentration is not high enough at the end, it is advised to repeat the procedure with a higher proportion of protease inhibitor cocktail). Incubate for 30 minutes on ice, and then clarify the lysate by spinning for 10 minutes at 12,000 RPM, at 4°C. Transfer supernatant (or protein mix) to a fresh tube and store on ice or frozen at -20°C or -80°C. Measure the concentration of protein using a spectrophotometer. determine the volume of protein extract to ensure 50 μg in each well. Add 5 μL sample buffer to the sample, and make the volume in each lane equalized using double distilled H 2 O (dd H 2 O). Mix well. (Tip: Total volume of 15 μL per lane is suggested). Heat the samples with dry plate for 5 minutes at 100°C. 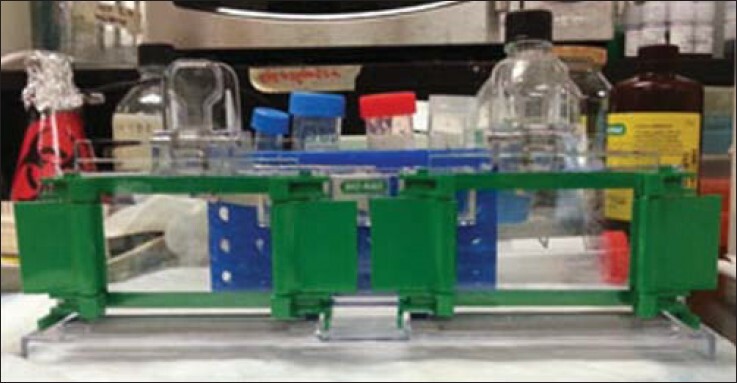 After preparing the 10% stacking gel solution, assemble the rack for gel solidification [Figure 1]. (Tip: 10% AP and TEMED solidify the solution; therefore, both gels can be prepared at the same time, if the abovementioned reagents are not added until the end). 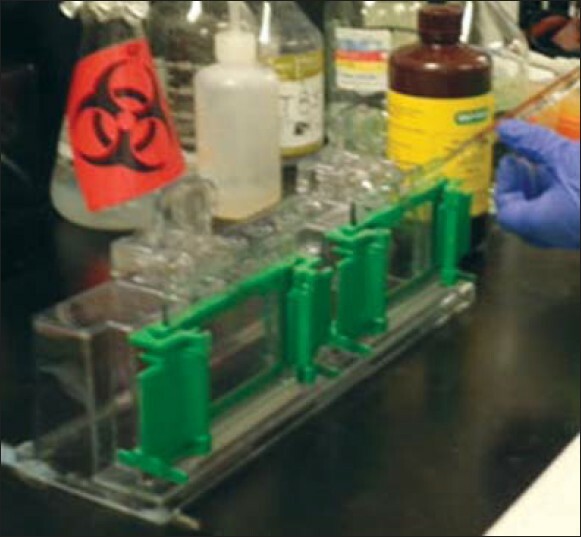 Add stacking gel solution carefully until the level is equal to the green bar holding the glass plates [Figure 2]. Add H 2 O to the top. Wait for 15-30 minutes until the gel turning solidified. 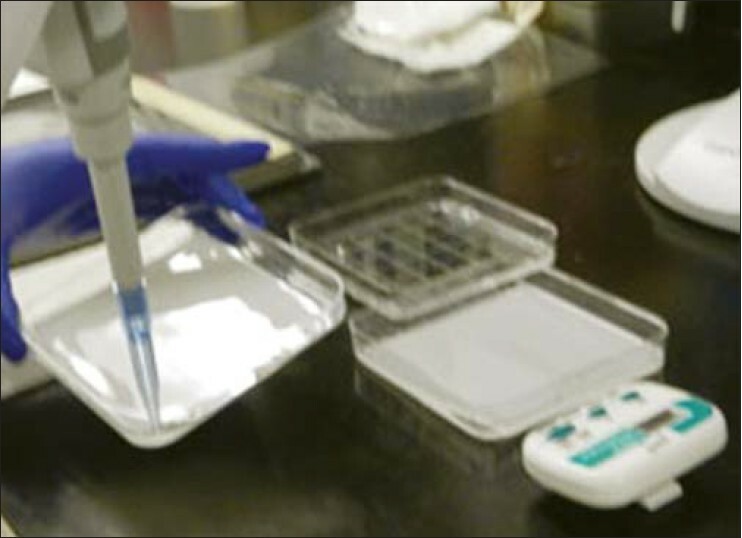 (Tip: Using a suction pipette can make the process of adding the gel to the glass plate easier). Overlay the stacking gel with the separating gel, after removing the water. (Tip: It is better to tilt the apparatus and use a paper towel to remove the water). Insert the comb, ensuring that there are no air bubbles. Wait until the gel is solidified. (Tip: Solidification can be easily checked by leaving some gel solution in a tube). Pour the running buffer into the electrophorator [Figure 3]. Place gel inside the electrophorator and connect to a power supply. (Tip: When connecting to the power source always connect red to red, and black to black). Make sure buffer covers the gel completely, and remove the comb carefully. Load marker (6 μL) followed by samples (15 μL) in to each well [Figure 4]. 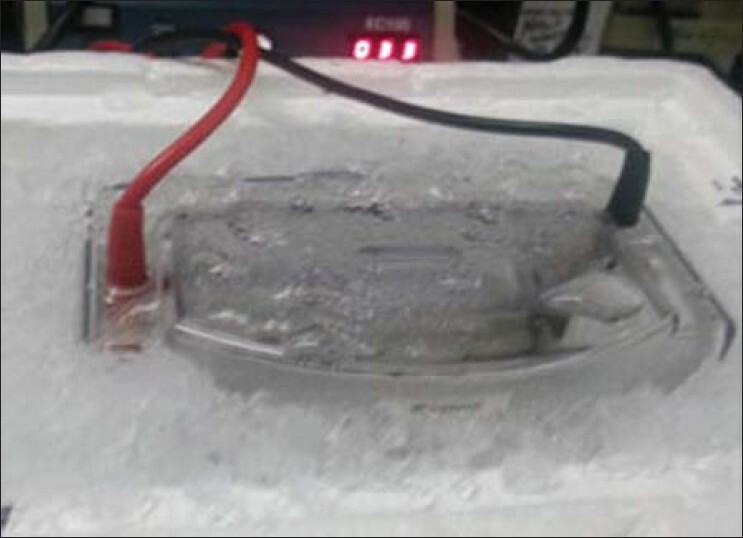 Run the gel with low voltage (60 V) for separating gel; use higher voltage (140 V) for stacking gel [Figure 5]a and b. Run the gel for approximately an hour, or until the dye front runs off the bottom of the gel [Figure 6]. Cut 6 filter sheets to fit the measurement of the gel, and one polyvinylidene fluoride (PDVF) membrane with the same dimensions. Wet the sponge and filter paper in transfer buffer, and wet the PDVF membrane in methanol. Separate glass plates and retrieve the gel. (Tip: Ensure there are no air bubbles between the gel and PVDF membrane, and squeeze out extra liquid). Relocate the sandwich to the transfer apparatus, which should be placed on ice to maintain 4°C. Add transfer buffer to the apparatus, and ensure that the sandwich is covered with the buffer. 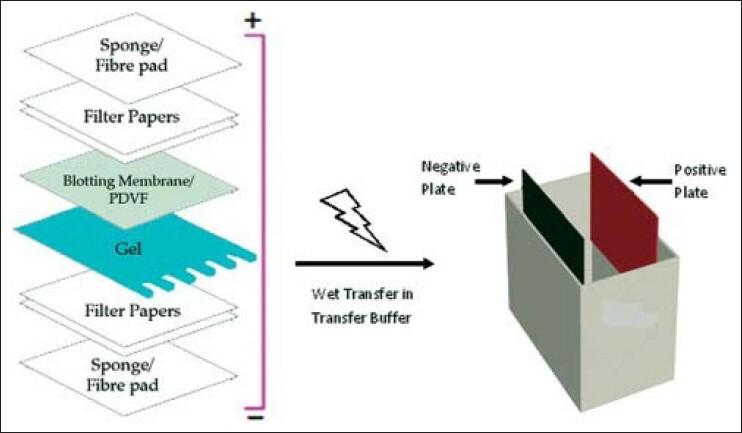 Place electrodes on top of the sandwich, ensuring that the PVDF membrane is between the gel and a positive electrode [Figure 7]. Transfer for 90 minutes [Figure 8]. (Tip: The running time should be proportional to the thickness of the gel, so this may be reduced to 45 minutes for 0.75 mm gels). Block the membrane with 5% skim milk in TBST* for 1 hour. Add primary antibody in 5% bovine serum albumin ( BSA) and incubate overnight in 4°C on a shaker [Figure 9]. Wash the membrane with TBST for 5 minutes. Do this 3 times. 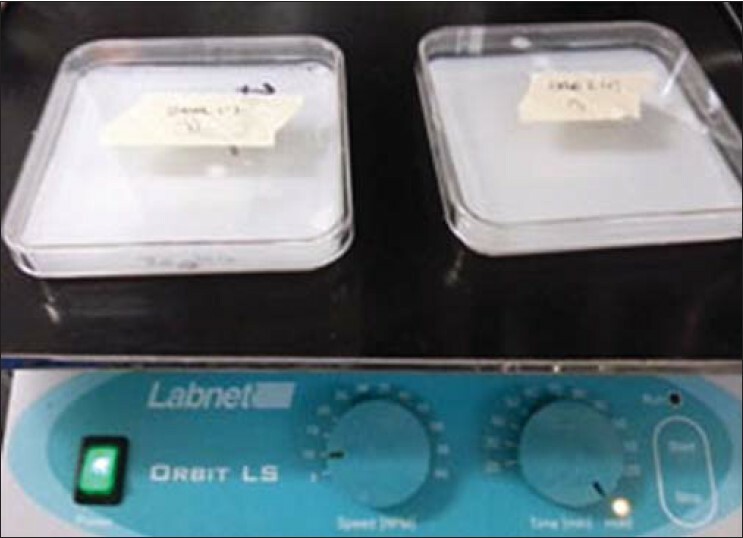 (Tip: All washing and antibody incubation steps should be done on a shaker at room temperature to ensure even agitation). Add secondary antibody in 5% skim milk in TBST, and incubate for 1 hour. Prepare ECL mix (following the proportion of solution A and B provided by the manufacturer). Incubate the membrane for 1-2 minutes [Figure 10]. (Tip: Use a 1000 μL pipette to ensure that ECL covers the top and bottom of the membrane). Visualize the result in the dark room [Figure 11]. (Tip: If the background is too strong, reduce exposure time). Cell lysates are the most common form of sample used for western blot. Protein extraction attempts to collect all the proteins in the cell cytosol. This should be done in a cold temperature with protease inhibitors to prevent denaturing of the proteins. Since tissue sample display a higher degree of structure, mechanical invention, such as homogenization, or sonication is needed to extract the proteins. After extracting the protein, it is very important to have a good idea of the extract's concentration. This eventually allows the researcher to ensure that the samples are being compared on an equivalent basis. Protein concentration is often measured using a spectrophotometer. Using this concentration allows to measure the mass of the protein that is being loaded into each well by the relationship between concentration, mass, and volume. After determining the appropriate volume of the sample, it is diluted into a loading buffer, which contains glycerol so that the samples sink easily into the wells of the gel. A tracking dye (bromophenol blue) is also present in the buffer allowing the researcher to see how far the separation has progressed. The sample is heated after being diluted into a loading buffer, in order to denature the higher order structure, while retaining sulfide bridges. Denaturing the high structure ensures that the negative charge of amino acids is not neutralized, enabling the protein to move in an electric field (applied during electrotransfer). It is also very important to have positive and negative controls for the sample. For a positive control a known source of target protein, such as purified protein or a control lysate is used. This helps to confirm the identity of the protein, and the activity of the antibody. A negative control is a null cell line, such as β-actin, is used as well to confirm that the staining is not nonspecific. 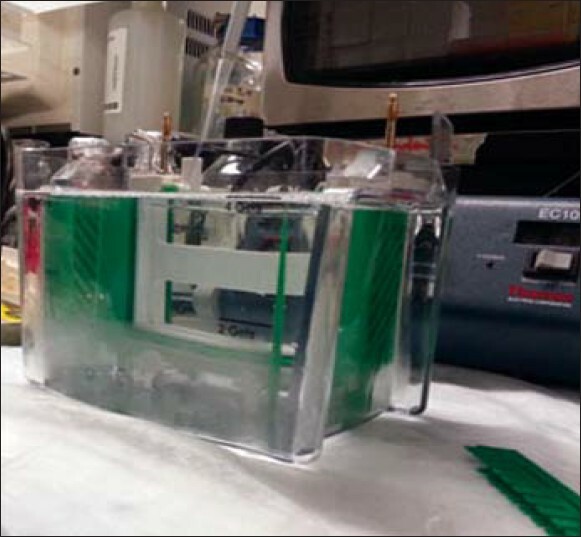 Western blot uses two different types of agarose gel: stacking and separating gel. The higher, stacking gel is slightly acidic (pH 6.8) and has a lower acrylamide concentration making a porous gel, which separates protein poorly but allows them to form thin, sharply defined bands. The lower gel, called the separating, or resolving gel, is basic (pH 8.8), and has a higher polyacrylamide content, making the gel's pores narrower. Protein is thus separated by their size more so in this gel, as the smaller proteins to travel more easily, and hence rapidly, than larger proteins. The proteins when loaded on the gel have a negative charge, as they have been denatured by heating, and will travel toward the positive electrode when a voltage is applied. Gels are usually made by pouring them between two glass or plastic plates, using the solution described in the protocol section. The samples and a marker are loaded into the wells, and the empty wells are loaded with sample buffer. The gel is then connected to the power supply and allowed to run. The voltage is very important, as a high voltage can overheat and distort the bands. After separating the protein mixture, it is transferred to a membrane. The transfer is done using an electric field oriented perpendicular to the surface of the gel, causing proteins to move out of the gel and onto the membrane. The membrane is placed between the gel surface and the positive electrode in a sandwich. The sandwich includes a fiber pad (sponge) at each end, and filter papers to protect the gel and blotting membrane [Figure 12]. Here two things are very important: (1) the close contact of gel and membrane to ensure a clear image and (2) the placement of the membrane between the gel and the positive electrode. The membrane must be placed as such, so that the negatively charged proteins can migrate from the gel to the membrane. This type of transfer is called electrophoretic transfer, and can be done in semi-dry or wet conditions. 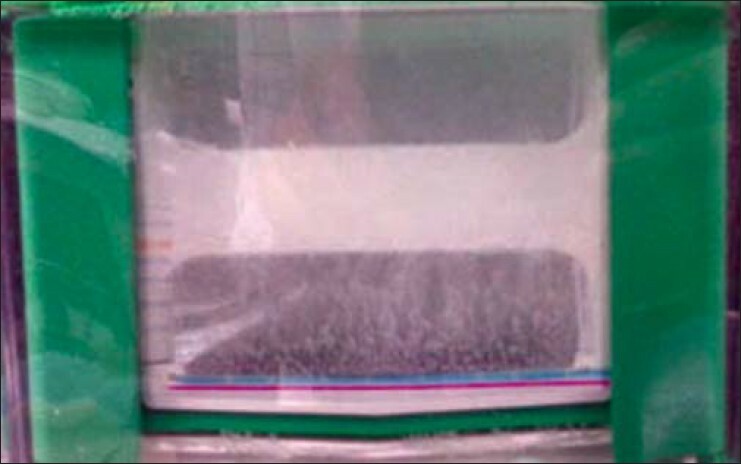 Wet conditions are usually more reliable as it is less likely to dry out the gel, and is preferred for larger proteins. The membrane, the solid support, is an essential part of this process. There are two types of membrane: nitrocellulose and PVDF. Nitrocellulose is used for its high affinity for protein and its retention abilities. However, it is brittle, and does not allow the membrane to be used for reprobing. In this regard, PVDF membranes provide better mechanical support and allow the blot to be reprobed and stored. However, the background is higher in the PVDF membranes and therefore, washing carefully is very important. Blocking is a very important step of western blotting, as it prevents antibodies from binding to the membrane nonspecifically. Blocking is often made with 5% BSA or nonfat dried milk diluted in TBST to reduce the background. Nonfat dried milk is often preferred as it is inexpensive and widely available. However, milk proteins are not compatible with all detection labels, so care must be taken to choose the appropriate blocking solution. For example, BSA blocking solutions are preferred with biotin and AP antibody labels, and antiphosphoprotein antibodies, since milk contains casein, which is itself a phosphoprotein and biotin, thus interfering with the assay results. It is often a good strategy to incubate the primary antibody with BSA since it is usually needed in higher amounts than the secondary antibody. Putting it in BSA solution allows the antibody to be reused, if the blot does not give good result. The concentration of the antibody depends on the instruction by the manufacturer. The antibody can be diluted in a wash buffer, such as PBS or TBST. Washing is very important as it minimized background and removes unbound antibody. However, the membrane should not be left to wash for a really long time, as it can also reduce the signal. The membrane is then detected using the label antibody, usually with an enzyme such as horseradish peroxidase (HRP), which is detected by the signal it produces corresponding to the position of the target protein. This signal is captured on a film which is usually developed in a dark room. It is very important to be aware that the data produced with a western blot is typically considered to be semi-quantitative. This is because it provides a relative comparison of protein levels, but not an absolute measure of quantity. There are two reasons for this; first, there are variations in loading and transfer rates between the samples in separate lanes which are different on separate blots. These differences will need to be standardized before a more precise comparison can be made. Second, the signal generated by detection is not linear across the concentration range of samples. Thus, since the signal produced is not linear, it should not be used to model the concentration. 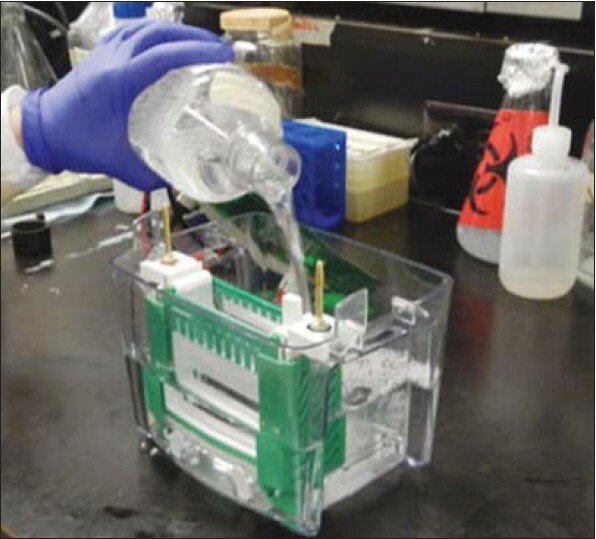 Even though the procedure for western blot is simple, many problems can arise, leading to unexpected results. The problem can be grouped into five categories: (1) unusual or unexpected bands, (2) no bands, (3) faint bands or weak signal, (4) high background on the blot, and (5) patchy or uneven spots on the blot. Unusual or unexpected bands can be due to protease degradation, which produces bands at unexpected positions. In this case it is advisable to use a fresh sample which had been kept on ice or alter the antibody. If the protein seems to be in too high of a position, then reheating the sample can help to break the quaternary protein structure. Similarly, blurry bands are often caused by high voltage or air bubbles present during transfer. In this case, it should be ensured that the gel is run at a lower voltage, and that the transfer sandwich is prepared properly. In addition, changing the running buffer can also help the problem. Nonflat bands can be the result of too fast of a travel through the gel, due to low resistance. To fix this the gel should be optimized to fit the sample. Finally, white (negative) bands on the film are due to too much protein or antibody. Another problem: no bands can also arise due to many reasons related to antibody, antigen, or buffer used. If an improper antibody is used, either primary or secondary, the band will not show. In addition, the concentration of the antibody should be appropriate as well; if the concentration is too low, the signal may not be visible. It is important to remember that some antibodies are not to be used for western blot. Another reason for no visible bands is the lowest concentration or absence of the antigen. In this case, antigen from another source can be used to confirm whether the problem lies with the sample or with other elements, such as the antibody. Moreover, prolonged washing can also decrease the signal. Buffers can also contribute to the problem. It should be ensured that buffers like the transfer buffer, TBST, running buffer and ECL are all new and noncontaminated. If the buffers are contaminated with sodium azide, it can inactivate HRP. Similarly, weak signals can be caused by low concentration of antibody or antigen. Increasing exposure time can also help to make the band clearer. Another reason could be nonfat dry milk masking the antigen. In this case use BSA or decrease the amount of milk used. High background is often caused by too high concentration of the antibody, which can bind to PVDF membranes. Another problem could be the buffers, which may be too old. Increasing the washing time can also help to decrease the background. Additionally, too high of an exposure can also lead to this problem. Therefore, it is advisable to check different exposure times to achieve an optimum time. Patchy and uneven spots on the blot are usually caused by improper transfer. If there are air bubbles trapped between the gel and the membrane, it will appear darker on the film. It is also important to use a shaker for all incubation, so that there is no uneven agitation during the incubation. Once again, washing is of utmost importance as well to wash the background. This problem can also be caused by antibodies binding to the blocking agents; in this case another blocking agent should be tried. Filtering the blocking agent can also help to remove some contaminants. Finally, this problem can also be caused by aggregation of the secondary antibody; in this case, the secondary antibody should be centrifuged and filtered to remove the aggregated. 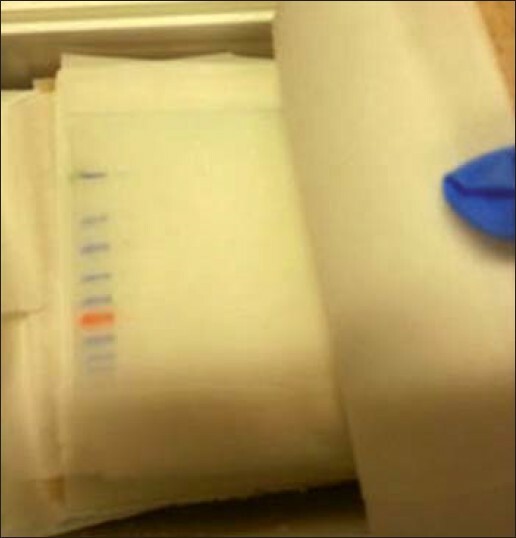 Western blot is a technique that is very useful for protein detection as it allows the user to quantify the protein expression as well. This paper covered the protocol, the theory behind that protocol, and some troubleshooting techniques. Western blot can be seen as an intricate balance, as the researcher attempts to get a nonspecific, yet strong signal. 41 How to make P-glycoprotein (ABCB1, MDR1) harbor mutations and measure its expression and activity in cell cultures? 43 ??????????????? ???????? ??????????????? ??????????????? ????????????? ??????? ??? ?????? ??? ???????? ?????? ?????????????? ??????? ?, "?????????" ?. ?. ???,?.?. ????????,?. ?. ????????,?.?. ?????????,?.?. ?????? 127 Different Effects of antimitotic drug on mechanical behaviors of Cancer cytoskeleton: Investigating distinct Grades of "colon Cancer cell lines"
Li, M.-Y. and Zhu, M. and Zhu, B. and Wang, Z.-Q.